Walking is a great form of exercise, but it can be hazardous to your health, especially if you walk along a roadway. At some point, everyone has been a pedestrian for an extended period of time. As the growing expense of insuring and driving a car continues to rise, more people are choosing to walk to their desired destinations. The number of pedestrians in Lubbock, Texas is increasing, so the number of pedestrian accidents is also on the rise. The majority of these accidents are often the result of an automobile hitting an individual. A Texas Department of Transportation report stated that there were 678 pedestrian fatalities on the roadway in Lubbock in 2016 alone. Here are some reasons why pedestrian accidents and fatalities are on the rise in Lubbock. The state of Texas has an increased number of pedestrian accidents each year, with a high amount occurring in the city of Lubbock. One of the most startling statistics was that there was not a single day without a car related death in Texas in 2016. There were 5,411 reported car accidents total in the city of Lubbock in that same year. Both motorists and pedestrians must engage in rational behavior or risk the probability that a car accident could take place. According to pedestrian laws in the state of Texas, all drivers must use good judgment in avoiding a collision with a pedestrian at all times. You can achieve this by yielding to them in the crosswalk, among other actions. All drivers must come to a complete stop or decrease their speed before passing another vehicle that appears to have stopped near a crosswalk. It is important to determine whether or not the vehicle ahead has stopped for a pedestrian to walk across the street. If you see a crossing guard at the street corner, then all vehicles must stop until every person has crossed the street. Pedestrians must use the sidewalk or the nearest crosswalk, crossing bridge, or tunnel when possible. It is important to obey all traffic control device signals and try walking on the left side of the street, especially if there are no sidewalks available. This allows you to face traffic so you can try to avoid getting hit if a driver does not pay attention. Never cross an intersection diagonally unless it is specifically designed for this type of movement. 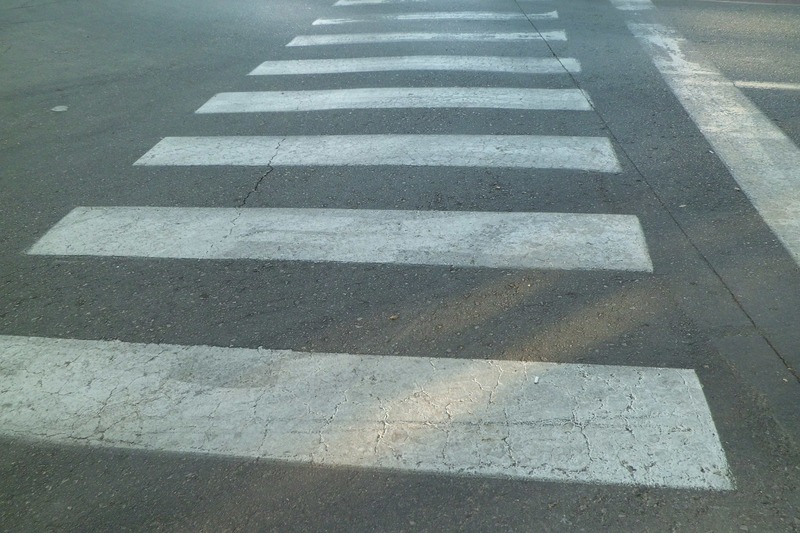 The most common causes for pedestrian accidents include a failure by drivers to check for individuals in the crosswalk and not obeying stop signs or red lights. Using electronic devices, making turns without paying attention, speeding, and driving under the influence of drugs and alcohol also contribute to pedestrian fatalities. Often, bike riders force pedestrians onto the road or hit them directly on the course of a walker’s pathway. Intersections are hotspots for pedestrian accidents, so be observant at all times. Parking lots are another dangerous location for pedestrian accidents, as most drivers are less likely to see a person walking when parking their cars. Many pedestrians are hit by automobiles making left-hand turns, because both parties have their attention elsewhere. Also, non-texting rules aren’t meant exclusively for drivers, as some pedestrian accidents occur because the victim was using an electronic device. Badly lit streets often cause pedestrians to be hit by vehicles, so it might be wise to carry a pocket flashlight for night walks. Finally, poorly-marked sidewalk zones that need immediate maintenance also cause pedestrian accidents. In these cases, a pedestrian and the driver are unsure of which person has the right away on the road. What happens after a pedestrian is hit by a car? If you have been hit by a car while walking, running, or jogging, it is important to get immediate medical attention as soon as possible. Injured parties should contact their insurance company to get a better understanding of their policy’s medical coverage as well. Most insurance policies have unique provisions that deal with injuries sustained from a pedestrian accident. Take the time to review the policy or speak with an insurance adjuster to get a better clarification on the coverage provided. If you need the help of an experienced car accident attorney, contact Attorney Dean Boyd and his team today. You can call us at (806) 242-3333 or Contact Us by email to learn more about our Car Accident and Pedestrian Injury services. You can also visit our office at 4423 SW 45th Ave in Amarillo, Texas or 5012 50th St #103 in Lubbock, Texas to see how we can help you.